This tutorial shows how to use django-bitcoin to receive and send money in your Python + Django application. The walkthrough guides how to create a bitcoin wallet in your Django application, buy bitcoins, transfers bitcoins into your application and then spend them. 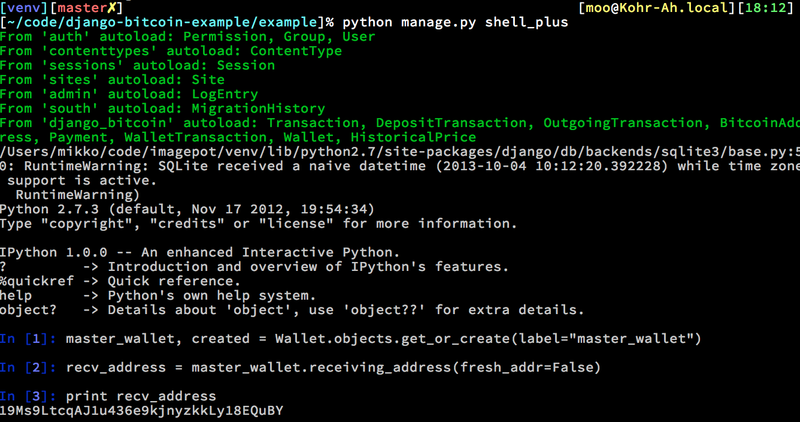 This all is done interactively from the command, Django shell and Python prompt.The tutorial was tested on OSX. It should work on Linux unmodified. On Windows you are on your own. django-bitcoin is a proven open source solution for handling bitcoins in your service. However, it might be rough on the edges, it is being actively developed and lacks satisfying documentation. If you need a helping hand to set it up please pop up on #localbitcoins-chat on irc.freenode.net or poke me by email. The tutorial Django application code is available on Github. It was originally presented in PythonBrazil 2013. The tutorial code is MIT licensed and uses my personal fork of django-bitcoin. Disclaimer: I work with the related projects. LocalBitcoins is hiring. LocalBitcoins is currently looking for fraud analyst, growth hacker, international support people and software developers. 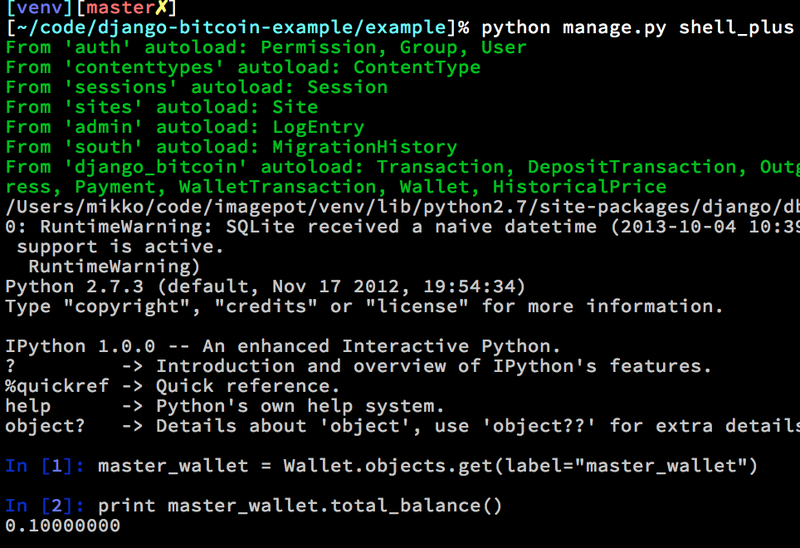 Bitcoin is money with API: very easy to handle programmatically. You can do it even from UNIX command line. No upfront contracts or paperwork needed. Bitcoin works in every country. Bitcoin market liquidity has risen to a level, so that it is easy for everyone to obtain bitcoins from LocalBitcoins.com. 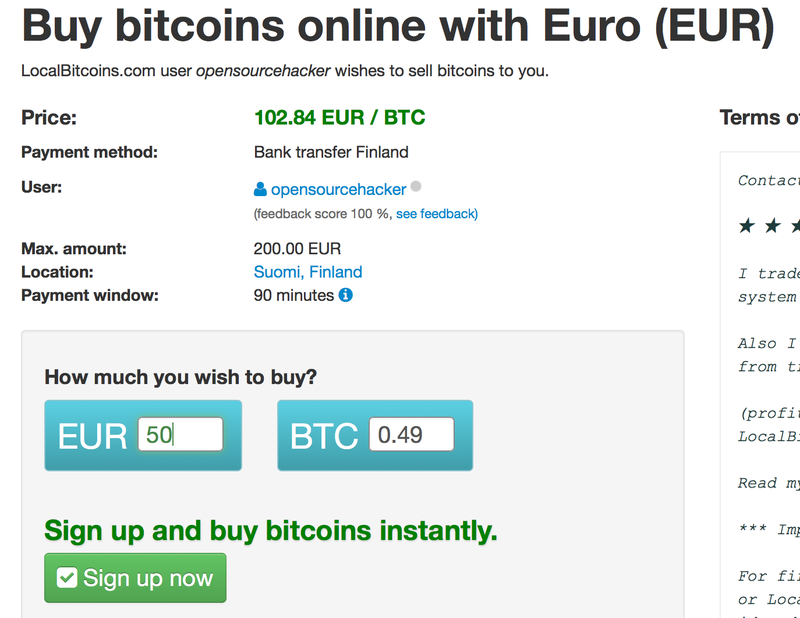 You can also convert bitcoins easily back to fiat currency, when you need to pay taxes. It is free from chargeback fraud. The system is based on mathematics instead of trust. Django basics: how to configure Django project, MySQL, models, South migrations, using interactive Python shell. Setup and configure memcached first. django-bitcoin creates a so called bitcoin web wallet in your Django project. You need to have a bitcoind installed on your desktop / server where you run the tutorial. Note that the bitcoind installation takes hefty 10-20 GB disk space for the block chain data. Blockchain contains all transaction history of bitcoin ever. bitcoind downloads this data from the bitcoin network and it may take a while. Configure your bitcoind to accept connection with username and password. A wallet, django_bitcoin.models.Wallet, is a combination of receiving and sending bitcoin addresses and stores the bitcoin value associated with these addresses. A wallet can have infinite number of sending and receiving bitcoin addresses. Bitcoin addresses can be created and used on demand. The sending and receiving addresses do not have relationship between them. When you receive bitcoins to your system they do not leave out from the same address. This is who most bitcoin web wallets behave. Write down the bitcoin address you got as we are later sending bitcoins into it. Go to LocalBitcoins.com and buy some bitcoins. LocalBitcoins.com is a person-to-person bitcoin exchange where you are not buying bitcoins from an organization, but from other users. This is easy and fast way to obtain your first bitcoins, as there is no cumbersome verification processes you need to undergo in centralized bitcoin exchanges. Think LocalBitcoins as eBay of bitcoins. If you are living a big city you can also try cash trade. You can buy small amounts of bitcoins from me. I can also sell bitcoins on PayPal on a request. 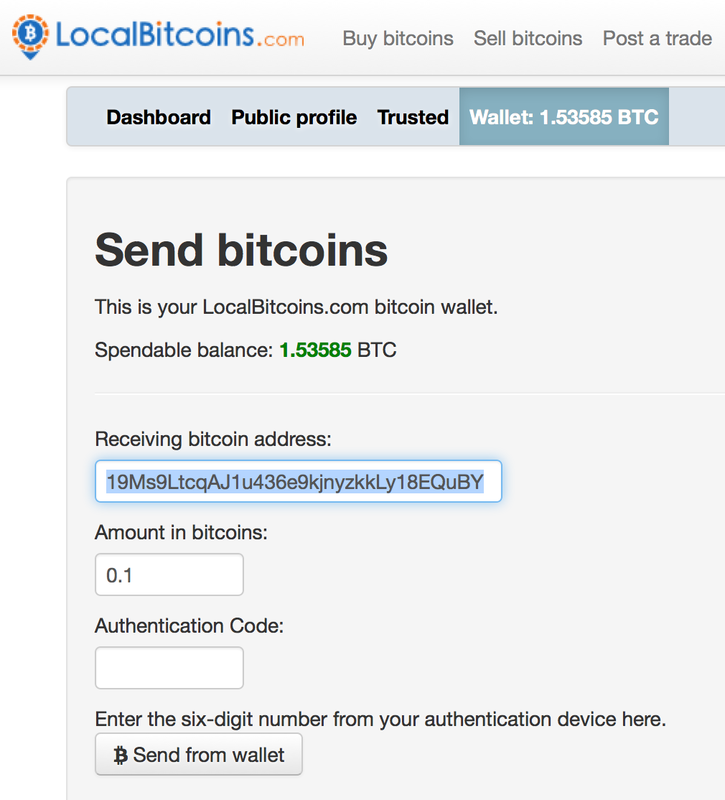 When you hit the Send on LocalBitcoins.com, the site submits the transaction to the bitcoin network. Bitcoin network consists of nodes which will confirm your transaction. After the certain transaction confirmation threshold is exceeded you can assume the transaction was safe and not double spent attempt. Usually this confirmation threshold is six confirmations, but you can set it lower if you want to have faster customer experience. It takes 5-30 minutes to process a transaction with six confirmations. Now, in our own example application polls bitcoind which listens to bitcoin network. bitcoind exposes a bunch of commands over JSON-RPC protocol. You can call these commands even from the UNIX command line. 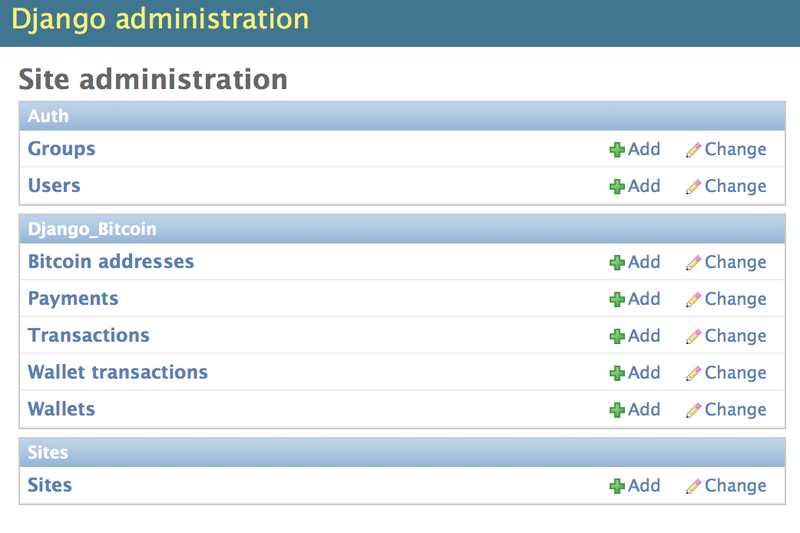 We have a Django management command for polling bitcoind. On each poll, we check the incoming transaction for receiving bitcoin addresses we have in our database. When the bitcoin network keeps confirming our transaction, the confirmation count of the transaction increases. When the threshold is exceeded, django-bitcoin writes down the transaction to the database as DepositTransaction and the amount of bitcoins in the wallet is increased. Now, we got the coins! Time to make some purchases. 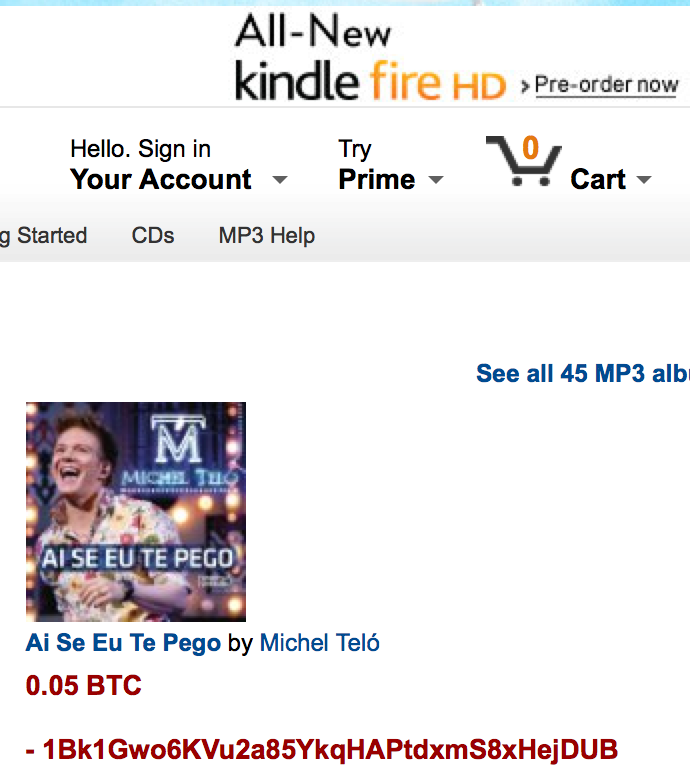 We go to an online shop selling high quality Brazilian music. Then we’ll send the bitcoins from our wallet to buy this wonderful piece of art (the screenshot below is a mockup and not an actual store). All bitcoin amounts are stored in Python decimal.Decimal instead of floats to avoid floating point rounding errors. Note that for every outgoing transaction there is a bitcoin network fee to compensate the bitcoin miners for confirming your transaction. The network fee is configured to be 0.0005 BTC in django_bitcoind by default. So the total amount to be send is the checkout price + network fee. Higher the paid network fee, faster the transaction is processed by bitcoin network. 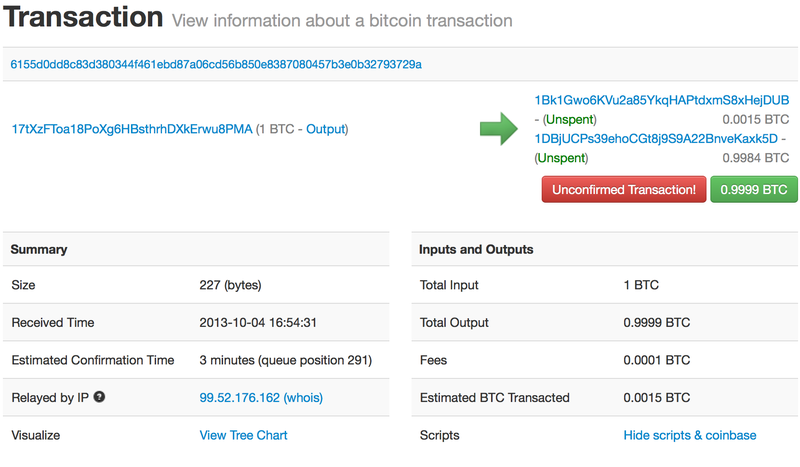 If you enter the receiving address to blockchain.info you can see your transaction statuses in the bitcoin network. This entry was posted in django, plone and tagged bitcoin, bitcoind, django, django-bitcoin, ipython, plone, python, virtualenv by Mikko Ohtamaa. Bookmark the permalink. Hi, I’m trying to get around django-bitcoin. It seems to be a nice app, but I still don’t get it clearly. As I can see it provides Wallets for multiplel users, like official bitcoind does. To my surprise, however, wallets are not mapped to accounts in bitcoind. Instead, there’s just one account (somerandomstring…). Could you please explain to me the reason of this implementation? Is it because of need for better scalability (supposing bitcoind does not scale good with thousands of accounts)? Also, can I be sure that the transactions will not mix up? Bitcoind provides API for retrieving addresses and balance per account, but here it is all one account, so is this handled by django-bitcoin logic? Thanks. I guess is that using one bitcoind account make things easier from the bitcoind connection perspective: you need to authenticate against bitcoind only once with one connection string. django-bitcoin contains some management scripts for retrieving the transactions https://github.com/miohtama/django-bitcoin/tree/master/django_bitcoin/management/commands – the account balance is hold in the database and not in bitcoind. CheckTransactions checks only for a fresh transactions of known bitcoin addresses (from db). This command is quite fast to execute. Then there are more strict check scripts which go through of every transaction of known bitcoin addresses from bitcoind. This is very slow process if you have thousands of addresses and cannot be run regularly. The reason I chose not to usein bitcoind accounts system, were scalability concerns heard from couple of sources. Is there anyway to get around the storage tax of the blockchain using something like electrum from a service state. Electrum is a SPV (or light wallet). It also has an API, but I wonder if it has a django wrapper so that the tax of having a bitcoin processing can be minimize. Alternative, can we just use our local wallet, and process the payment remotely (forward the payment to our wallet) wtihout really getting into hosting a wallet on our VPS. I don’t think what you describe exist, but I am not sure. You can use a pruned node to avoid using the entire blockchain. This will minimize your ‘bitcoin tax’ ?